My two best friends – my only two friends really – Ella ad Beth follow my gaze and laugh. We’re sitting on the outskirts of the cafeteria, outcasts physically and socially. We’re proud of this. We strive for this. When Jen makes a bet with her friends that she can turn geeky boy Trevor into a bad boy, the goth girl thinks it’ll be an easy task which should complete just around the time she wants to get kicked out of her current foster home. The winnings will see her best friends pay for her new lip piercing, which is guaranteed to cause problems with the do-gooder foster family. However Jen may have bitten off more than she can chew with Trevor and soon becomes sucked into his sci-fi movie loving friendship group, family bowling nights and community centre volunteering. Can she change Trevor without changing herself and can she come to terms with the past which has haunted her for the whole of her fostering life. I fully intended to love this book – it had snark, a goth girl and its fair share of geeks – what wouldn’t I love? So I started reading and soon found that, even with that winning combination, Geek Girl sadly wasn’t going to deliver for me. Don’t get me wrong, there were parts of the book I loved. Jens background was brilliant developed and I really wanted to know what had happened to her to make her act in the way she did with her fosterers, it really added a lot of depth to the story. I really enjoyed the message it puts across about loving yourself and being yourself but I didn’t like Jens wat of dealing with things. Jen isn’t happy – she’s had an awful life and is used to running away before anything bad happen out of her control. She goes from foster home to foster home making them give her up by doing something bad. The Clarks are different but she’s still not planning on staying with them and the plan with trevor develops well in time so that she can arrange a blowout for the end of the year. Once Jen starts on her project she pretty much ditches her friends – that’s the first bit of the book I didn’t like. I understand that the point of the vook was that Jen changes herself to become a nicer and more rounded person but she changes in nearly everyway once she gets to know Trevor and that’s the second thing I didn’t like – she loses what she was for a boy and while I think Bennett tried to convey that Jen wasn’t happy with who she was in the first instance (which I’m not convinced was fully the case, there must have been aspects of the life and personality that she did enjoy) I didn’t like the way the changes came about. I also didn’t like the way the alternative lifestyle of her friendship group was put across or the way Jen dealt with her older friends. The book kind of put it across that the whole outcast ‘goth’ lifestyle was bad and wrong which is quite stereotypical and upsetting to me as that was my friendship group in college and there was nothing wrong with any of us or it. I also wasn’t impressed by the writing and there was a few places when Jen would be talking or narrating and It just dint feel right – it didn’t sound right, like it wasn’t how the reader would expect her character or a teenager of that age to talk. All in All Geek Girl isn’t highly rated from me – I liked some aspects and thought a lot of the story was interesting but the negatives far outweigh the positives. I’m sure other people would disagree though and some readers will enjoy it. What I can say for it though is that it would probably make a very good teen chick flick! 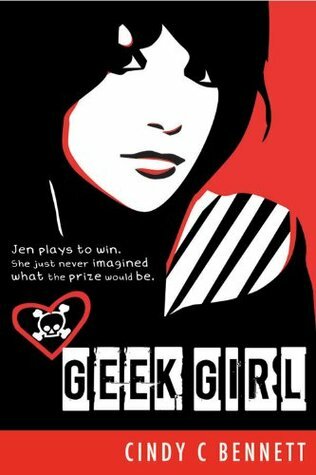 Geek Girl was published by Ceder Fort in December 2011. My copy was obtained very NetGalley in exchange for an honest review. The blurb makes it look like on of the few kinds of contemporaries I’d enjoy-shame you didn’t enjoy it. Badly written subculture/friendships really kill a book. I’ll give it a go though. Thanks for the review.